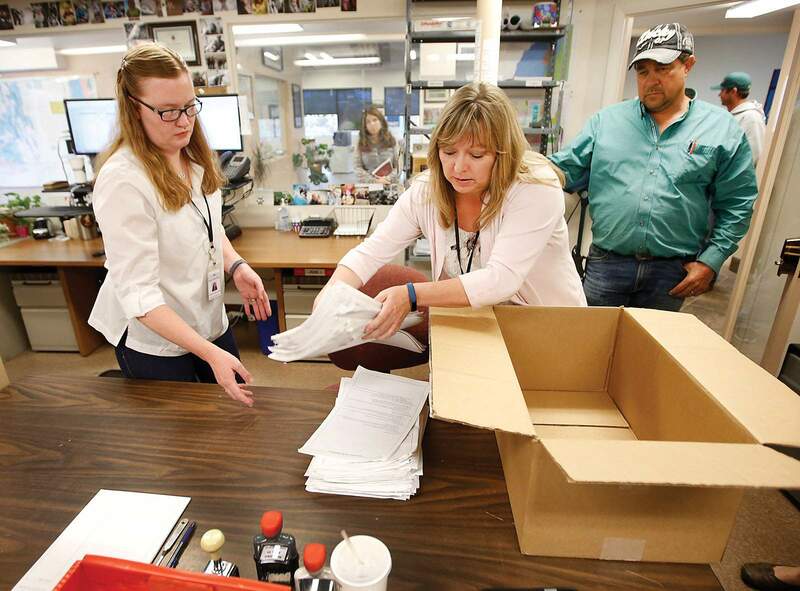 La Plata County Clerk and Recorder Tiffany Lee Parker empties a box of additional petition sections that were turned in to her office for the amended recall of La Plata County Commissioner Gwen Lachelt. County Commissioner Gwen Lachelt came within an inch of having to face a recall election. Signature gatherers were only three dozen signatures short of the more than 7,000 necessary to trigger the election. That is about as close as can be. And how would an election have turned out? It might have been very close. Lachelt’s critics showed themselves to be very determined, while the local Democratic Party has a history of mobilizing its members. Let’s consider Lachelt’s critics, with the number of signatures gathered, to have been successful without reaching an election. The large number of signatures gathered by unpaid volunteers indicates significant displeasure with what they perceive as Lachelt’s negative attitude toward the natural gas industry. An election would have brought uncertain challenges. Even if it had been a special election, at a cost to taxpayers, procedural requirements would have placed it mid-summer or later. Until that date, or Nov. 6, the regular election, opponents – and Lachelt’s supporters – would have had to continue energizing their followers. That continued divisiveness would have been exhausting for the county. Lachelt has been labeled an enemy of the natural gas industry through her longtime advocacy of strict, proper environmental behavior by that industry, and limited if any show of appreciation for the wealth the industry was bringing to mineral owners, the various levels of government and to the general economy. A defense of the environment is critical – well site equipment and aboveground gas lines should not leak, well pads can be shared, right-of-ways should be limited in width, truck traffic held to a minimum – and Lachelt has done that well through her non-profit advocacy with the San Juan Citizens’ Alliance and as a commissioner. But should there have been a bit more of a we’re-glad-you’re-here-to-make-possible-a-stronger-economy outreach on her part? Perhaps so. And do her critics need to acknowledge that falling gas production and revenues are due to market forces and renewable energy development, not the actions of one commissioner? We think so. What to do going forward? Lachelt has almost two-and-a-half years remaining in her second and final term. Can her relationships with many of her critics, which if improved would help make La Plata County an even more appealing place to live, be productive during that time? The county is immersed in shaping a land use plan tailored somewhat to the planning districts, and it is struggling with reduced revenues from energy taxes. County roads and bridges still require attention after two failed mill levy elections. A three-member board of county commissioners requires that all three commissioners be as engaged as possible. Commissioner Lachelt and her critics should take a few steps toward one another to explore where they have common interests and where they can join to move the county forward. Nearly two-and-a-half years is too long to remain in opposition.